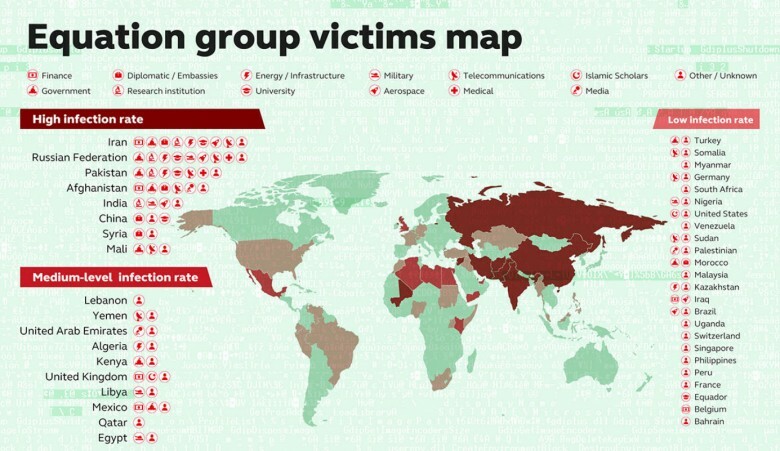 The Equation Group is a highly sophisticated threat actor described by its discoverers at Kaspersky Labs as one of the most sophisticated cyber attack groups in the world and “the most advanced … we have seen”, operating alongside but always from a position of superiority with the creators of Stuxnet and Flame. The name Equation Group was chosen because of the group’s predilection for strong encryption methods in their operations. By 2015, Kaspersky documented 500 malware infections by the group in at least 41 countries, while acknowledging that the actual number could be in the tens of thousands due to its self-terminating protocol. They are suspected of being tied to the United States National Security Agency (NSA). The Intercept has run a paper where they link the Equation Group to the NSA, citing the Snowden leaks. By 2015, most of their targets had been in Iran, Russia, Pakistan, Afghanistan, India, Syria, and Mali. At the Kaspersky Security Analysts Summit held in Mexico on February 16, 2015, Kaspersky Lab announced its discovery of the Equation Group. According to Kaspersky Lab’s report, the group has been active since at least 2001, with more than 60 actors. The malware used in their operations, dubbed EquationDrug and GrayFish, is found to be capable of reprogramming hard disk drive firmware. Because of the advanced techniques involved and high degree of covertness, the group is suspected of ties to the NSA, but Kaspersky Lab has not identified the actors behind the group. In 2015 Kaspersky’s research findings on the Equation Group noted that its loader, “Grayfish”, had similarities to a previously discovered loader “Gauss” from another attack series, and separately noted that the Equation Group used two zero-day attacks later used in Stuxnet; the researchers concluded that “the similar type of usage of both exploits together in different computer worms, at around the same time, indicates that the EQUATION group and the Stuxnet developers are either the same or working closely together”. They also identified that the platform had at times been spread by interdiction (interception of legitimate CDs sent by a scientific conference organizer by mail), and that the platform had the “unprecedented” ability to infect and be transmitted through the hard drive firmware of several of the major hard drive manufacturers, and create and use hidden disk areas and virtual disk systems for its purposes, a feat demanding access to the manufacturer’s source code of each to achieve,[8:16–18 and that the tool was designed for surgical precision, going so far as to exclude specific countries by IP and allow targeting of specific usernames on discussion forums. The NSA codewords “STRAITACID,” and “STRAITSHOOTER” have been found inside the malware. In addition, timestamps in the malware seem to indicate that the programmers worked overwhelmingly Monday–Friday in what would correspond to a 08:00–17:00 workday in an Eastern United States timezone. Kaspersky’s global research and analysis team, otherwise known as GReAT, claimed to have found a piece of malware that contained Stuxnet’s “privLib” in 2008. Specifically it contained the LNK exploit found in Stuxnet in 2010. Fanny is classified as a worm that affects certain Windows operating systems and attempts to spread laterally via network connection or USB storage. Kaspersky stated that they suspect that because of the recorded compile time of Fanny that the Equation Group has been around longer than Stuxnet. F-Secure claims that the Equation Group’s malicious hard drive firmware is TAO program “IRATEMONK”;one of the items from the NSA ANT catalog exposed in a 2013 Der Spiegel article. IRATEMONK provides the attacker with an ability to have their software application persistently installed on desktop and laptop computers, despite the disk being formatted, its data erased or the operating system re-installed. It infects the hard drive firmware, which in turn adds instructions to the disk’s master boot record that causes the software to install each time the computer is booted up. It is capable of infecting certain hard drives from Seagate, Maxtor, Western Digital, Samsung, IBM, Micron and Toshiba. In August 2016, a hacking group calling itself “The Shadow Brokers” announced that it stole malware code from the Equation Group. Kaspersky Lab noticed similarities between the stolen code and earlier known code from the Equation Group malware samples it had in its possession including quirks unique to the Equation Group’s way of implementing the RC6 encryption algorithm, and therefore concluded that this announcement is legitimate. Edward Snowden has speculated that The Shadow Brokers is actually Russian intelligence. The most recent dates of the stolen files are from June 2013, thus Snowden speculates that a likely lockdown resulting from his leak of the NSA’s global and domestic surveillance efforts stopped The Shadow Brokers’ breach of the Equation Group. Exploits against Cisco Adaptive Security Appliances and Fortinet’s firewalls were featured in some malware samples released by The Shadow Brokers. EXTRABACON, a Simple Network Management Protocol exploit against Cisco’s ASA software, is a zero-day exploit as of the time of the announcement. Juniper also confirmed that its NetScreen firewalls were affected. It’s surprising to find on worldinwar.eu a resource so precious about equations. We will note your page as a benchmark for Equation Group – World in War.